As CRMs become more advanced and new technologies, such as chat bots or the Internet of Things (IoT), grow in popularity, there is an underestimated advantage to having an agile and intelligent CRM to help businesses achieve process changes and positive marketing outcomes at a more rapid pace. The competition in today’s ever-evolving digital environment has reached cutthroat levels, and the B2B marketing landscape is no exception. As marketing pros strive to keep their products and services on the forefront of their audiences' minds, more and more businesses turn to agile and intelligent CRMs to help them swiftly react to market changes. Such solutions, with an underlying Business Process Management (BPM) engine, equip them with advanced, yet easy-to-use tools to effortlessly adjust their marketing processes and optimize marketing campaigns on the fly. Agile CRM systems don’t require specific computer skills to build or alter most sophisticated campaigns. For instance, each member of the marketing team can easily manage multiple, simultaneous multichannel campaigns with specific rules, scenarios and conditions. What’s more, with the configuration tools and user interfaces that agile CRM systems can provide, end users have an ability to deeply configure the system to meet their specific needs. With all the challenges that come with complex omnichannel buying cycles, businesses need tools that literally leave no lead behind. For more precise and effective customer segmentation and management, intelligent CRM tools provide B2B marketers with an ability to automatically assign new leads to the most relevant segment, as well as map them to existing customers based on specific criteria. For instance, next-gen CRM systems will track website session parameters, buying behavior, similar contact details and profile data in order to assign leads to the most relevant group. With intelligent segmentation, B2B marketers can determine how to alter their strategies, track their customers’ preferences and attitudes to products or services, find out what drives them to choose your company and figure out what marketing channels are most likely to be effective in targeting them.This knowledge enables organizations to better focus their efforts and increase sophistication and efficiency of the lead-to-revenue cycle. Intelligent CRM systems with automated lead scoring based on BI algorithms (such as factor analysis and statistical models) identify key factors that influence lead maturity and assign the most appropriate weight to each factor. The algorithms take historical and behavioral data from the CRM system and combine it with “big data” attributes gathered from various sources. The method uses the collected data to build multiple models, and scores new leads to determine their readiness to be handed off to sales. In this way, companies can logically prioritize their sales and marketing efforts and focus on approaches that generate leads with the highest score or quality. Another core benefit of having an agile CRM system in place is intelligent nurturing campaigns. These tools can deeply analyze lead data such as their browsing activities, profile information, purchasing behavior and service requests, and then automatically assign the lead to the most relevant lead nurturing campaign. This allows marketers to reach out to prospects with well-devised, highly personalized approaches and offers rather than broadcasting the same product or service to all customers. Instead of a static approach, intelligent lead nurturing provides cutting-edge data-driven techniques to craft B2B campaigns, taking into account not only lead behavior but their connections within an organization to determine the decision-makers and prioritize communication. Overall, intelligent and agile CRM solutions are a goldmine for the whole organization, since they enable businesses to effectively handle the entire customer journey from the first stages of the customer acquisition to repeat sales and loyalty. Such solutions are capable of bridging the gap between marketing, sales and service, which enables extensive collaboration opportunities and allows for sharing critical customer data and analytics between departments instantly. As a massive communication revolution occurs and the buyer’s behavior continues to change, organizations should get prepared for the new business paradigm. Implementation of top-notch CRM technologies will help equip businesses and marketers with the right tools to gain a genuine competitive advantage in today’s fast-paced market. 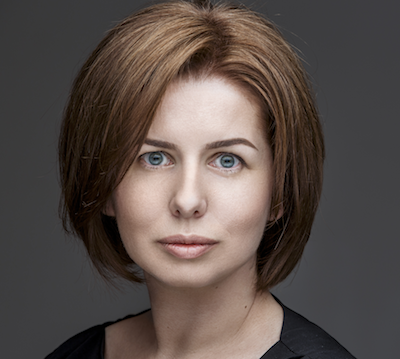 Katherine Kostereva is CEO, Co-Founder and Managing Partner at bpm’online, a vendor of process-driven, cloud-based software for marketing, sales and service automation. She strongly believes that BPM and CRM synergy brings exceptional value to the software users.